The team here admire the way that some manufacturers use materials to their customers’ advantage while keeping aesthetics in the forefront of their design – such a manufacturer is our sales partner Sugatsune whose range of neodymium magnetic catches stand out for their high performance and very neat design. Back in the eighties the first neodymium magnets were devised by companies in Japan and America. They are enormously strong compared to ferrite magnets and have found themselves at the heart of many aspects of modern technology, from hard drives to hybrid and electric cars. We like them because their density and strength allow incredibly thin magnetic catches to be produced like the MC159. At less than 3mm thick it is an easy to fit closure device which does not disrupt the integrity of your design. Perfect for sheet metal applications it can also be utilised in furniture production where the ample 4kg force will keep large doors closed. A lower strength version, the MC-158 has the same great looks but lesser strength at 1.5kg for those light weight applications, at the other end of the scale an 8kg force version has also recently been introduced. But the focus is not just on looks – they have concentrated on sound too. Whilst the satisfying “Click” of a magnetic catch closing might reassure most, in some applications a quiet close is also desirable and “sealed catches” offer this feature. The MC-MS45 is covered in silicone rubber to deaden sound and the MC-JM45 is perfect for clean rooms, being completely sealed in polypropylene making them NSF approved. For general use they have nickel plated versions and for more corrosion resistant latches like the MC-159SUS, they coat the magnet with an acrylic resin. For temperatures exceeding 80°C and up to a whopping 250°C there are catches like the MC-YN001 HP made from a Samarium Cobalt magnet. 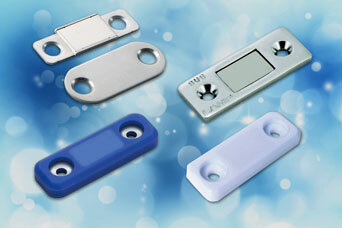 Also worth a mention within this great range is the tiny 2.2mm thick MC-YN001 magnetic catch family. The MC-YN001 family is smaller and thinner and comes in nickel-plated or corrosion resistant stainless steel. Magnetic catches are available on our online store. Share the post "New range of small and powerful magnetic catches"